On 11-15 of December our colleague Sviatoslav Gusev participated in International Workshop on Optics and Photonics in Quaid-Azam University Islamabad, Pakistan. The purpose of the meeting was to bring together the number of ICO-ICTP Gallieno Denardo Award winners and other leading scientists from around the world, working in the area of Optics and Photonics, to promote new ideas, discuss latest research trends and share their innovative work. 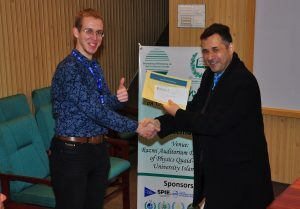 During the meeting, Sviatoslav represented his work “Blood glucose concentration sensing using THz spectroscopy” and won OSA Student Prize for the best oral conference talk. The participation was funded by IWOP-2017 Travel Grant.